Besides the avian attributes of flight, feathers and laying eggs, potoos are quite possibly the most unbird-like birds in the world. Sometimes called “Poor-me-ones” on account of their haunting calls, these bizarre denizens of the night come in 7 different flavors from the family Nyctibiidae within the order Caprimulgiformes. 10,000 Birds writers have previously featured 2 of the 7 species (Renato’s post on Rufous Potoo and Corey’s post on Great Potoo) and now you’ll meet a third, the “Patoo with the long bill” as it is called by the Jamaicans or the Northern Potoo, Nyctibius jamaicensis. Northern Potoos are found from Mexico to Costa Rica and on the islands of Jamaica and Hispaniola. They are large birds and, like other members of the family, are known for their habit of perching motionless and upright on a branch or fence-post, looking for all the world like an extension of the branch they are sitting on. A couple of REALLY interesting characteristics of potoos just cannot be overlooked. The first is not always evident at fist glance – its mouth. This bird’s gape is impossibly large and cavernous and is used to net beetles, moths, insects and even small birds. Secondly, if one comes across a Northern Potoo at its roost in the daytime look closely at its eyes, particularly its eyelids. You will notice several slits in the eyelids that allow the bird to detect light changes and movement even while its asleep! This is an adaptation that it shares with other potoo species, as shown in Corey’s photo of a roosting Great Potoo. Another really bizarre attribute of the potoos is their seemingly casual behavior of laying eggs on bare branches without any attempt to build nests. In reality though, this is actually a pretty stellar nesting strategy. You see, potoos don’t require a nest to protect – or hide – their eggs and young. A nesting potoo simply chooses a suitable knot in the branch, lays its egg, and its body does the protecting and the hiding. Potoos that are brooding simply look plumper than normal! The Northern Potoo was previously lumped with the Common Potoo and the two species are virtually indistinguishable in the field. However, stark differences in vocalizations prompted the split. 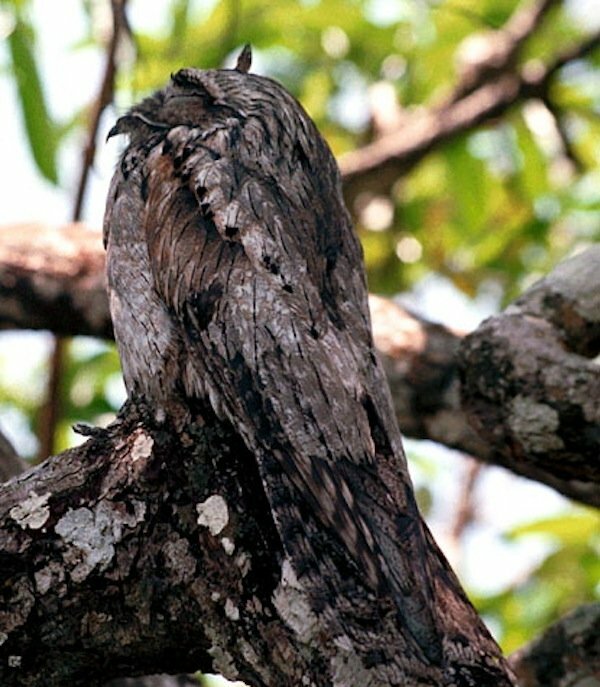 The Common Potoo’s call is a loud, descending whistle. But the Northern Potoo’s call can at best be described as frightening and at worst as the sound of a night-troll cackling as it cooks an unfortunate victim. “Whhhaaaaaaa, whu whu whu whu whu whu”. And it was this call that alerted us to its presence on a recent trip to Jamaica. We had searched high and low for about 2 hours, walking up and down a steep farm road that was well known for its guaranteed sightings of Northern Potoos. “Its as easy as pie!”, the local landowner had assured us. “You just walk the road and you will see one sitting on the fence-posts. I’ve never missed them!” But we had given up, dejected at the fact that we were probably the only birders to ever miss this bird here (Greencastle Estate on the northeast coast), and were walking back up to the house when we heard it. The unmistakable call of a troll cackling at its terrified victim. A Northern Potoo. Problem was it was calling from the other side of a large boggy field. Undeterred we crossed through several barb-wire fences and some pretty thick bush before we spotted the red eye-shine of a perching Northern Potoo. What a truly fantastic and enigmatic bird! This is awesome, James. I’m jealous that you found the potoo, but glad you brought back footage! Thanks for sharing such awesome footage of a potoo! I dont get to see these in Costa Rica near as much as I would like! @Pat: Yeah I’ve heard they are not as easy to see on the mainland. And I believe only in the north of Costa, right? Superb, that video is great. I live in kent in England and on Friday I see this bird in my pine tree I have photos of it as I have never seen anything like this before I did think it was an owl at first then when I got closer I realise it wasn’t, it did open it’s mouth which is why I thought it was such a strange bird ! Is it usual to see this bird in England?